This was an illustration for a friend’s short story collection. The story tells of a mother who wakes up one morning, and looks at her sleeping husband next to her. As she walks through her house, she thinks about her 2 daughters, one about to be married, the other going off to college. She walks downstairs, and she begins to visualize the memories of her and her families’ life. She makes a cup of coffee, and walks outside into the winter morning. As she walks through the snow covered trees, she thinks about how people nowadays are just to busy to notice the small things in life, the birds in the trees, the wind in your hair, the snowflakes falling around you. She comes upon the edge of a frozen river, slips her robe off, and walks to the center. She smiles as she stands on the ice, arms outstretched, as the ice cracks and buckles underneath her. This piece was completed entirely with charcoal and white pastel. 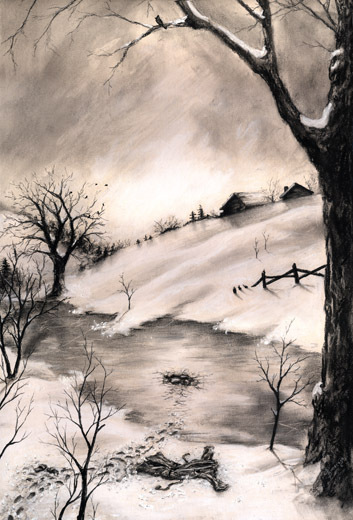 The goal was to juxtapose the sad, jarring story with a calm, serene landscape. The original sold at Dragon*Con in 2008.